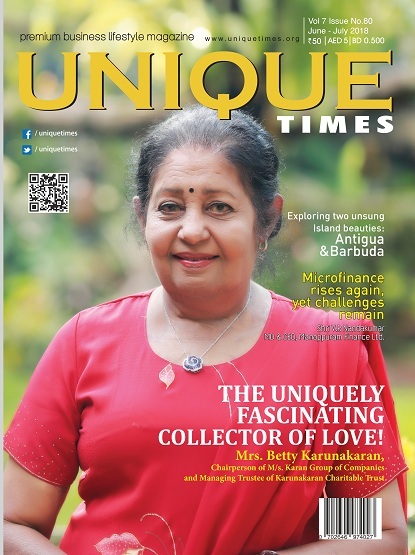 In this edition, Unique Times is extremely proud to present a very Unique personality, who has set her soul on fire to live on this planet. She wanted to share a portion of this fire with rest of humanity and hence built a commemorative museum dedicated to her soul partner for the world to see. We are awestruck by this amazing woman’s passion for life and how she has used that fire to ignite a lot others through her inspiration. Ms. Betty Karuna Karan has a vivid eye for fine, artistic possessions. She is the wife of Late Revi Karuna Karan. She is the Chairperson of the Karan Group of Companies and the Managing Trustee of Karuna Karan Charitable Trust, Alleppey. 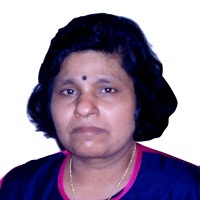 Revi Karuna Karan, was a leading coir exporter from Kerala and former director of the Industrial Development Bank of India (IDBI). He was the Chairman and Managing Director of the Karan Group of Companies – the largest exporter of coir products from India. 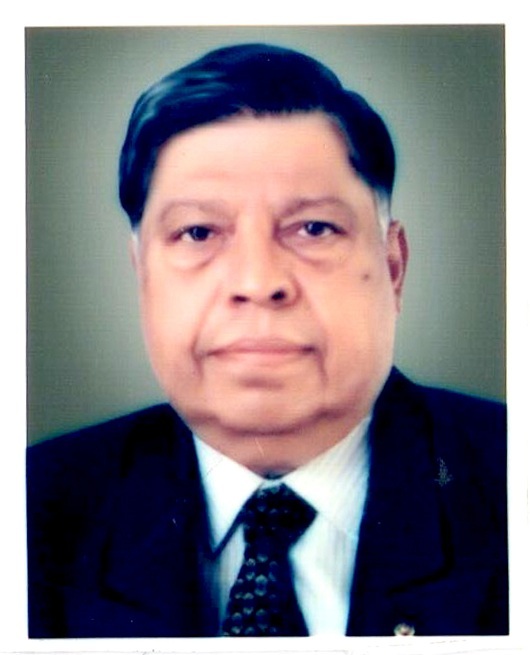 He made significant contributions towards the modernization of the coir industry in India. After completing his secondary school education from Surrey, UK, studied high school at Lausanne, Switzerland. Later, he graduated with a degree in Business Administration from Babson College, MA, USA. Revi was a polyglot and fluent in several languages such as German, French, English, Italian, Spanish, Dutch and Malayalam. After his father’s demise in 1952, Revi took over the leadership of the companies at the young age of twenty. Revi married Betty in 1957 and they have a daughter Lullu. He was the chairman of the Karan group, which includes companies such as Kerala Balers, William Goodacre & Sons and Alleppey Company, all leading coir export houses. Following a brief illness, Revi passed away on 25 November 2003. Some romance breathes beyond the grave; We have heard stories about eternal love – exceptional and unique story of Betty’s love for Revi restores and reinstates our belief in everlasting love. She was always fascinated to collect antiques and priceless pieces, right from her childhood days. One such precious piece is a vase she bought when she was 13 years old for a mere 6 or 7 rupees, a substantial amount at that time. Eventually, she was married into Revi’s family, who were avid collectors of fine arts and artefacts for over three generations. The collection was maintained in private domain all her life. After Revi’s demise, Betty decided to open up this rare and wide collection to the public. Betty and Lullu dedicated this museum to the beloved husband and a loving father, whose memories lives with them forever. 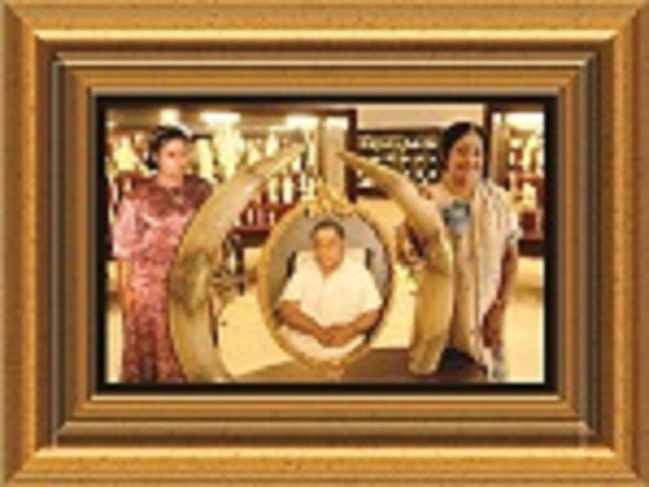 The museum, a devoted monument to her late husband, Mr. Revi Karuna Karan, was inaugurated on the 22nd November, 2006, by the former Meghalaya governor, Sri. M.M. Jacob. The RKK museum is indeed an architectural marvel. Betty, having travelled around the globe numerous times, has an eye for details and is very conversant in art domain. It was her wish to have the Museum built in classic Greek architectural style. Besides crystal ware, the museum has a magnificent inventory of artefacts in porcelain, ivory, china, antique furniture, carpets, glassware, exclusive paintings etc. The museum showcases valuables from her personal collection, also of Swarovski crystals, perhaps the single largest private collection in the world, outside Wattens, the home of Swarovski. The stunning panoply of three generations of a family sprawls under 2 floors of the building. Betty talks ardently about collecting treasured relics, a Passion that is inborn in her. You are inherently inclined to certain things in life from birth. Thus, her penchant for artistic things was revealed when she picked up the small German vase when she was so young at 13. It pinched when she bought the precious object. Her forefathers were also art-lovers, and she grew up seeing the immensely large collection. Unity and love kept the heirlooms intact and in good shape, Betty held the cache safe in her hands all these years. When she got married, she started traveling the globe with her dear husband who was born into a family of tradition and prestige. 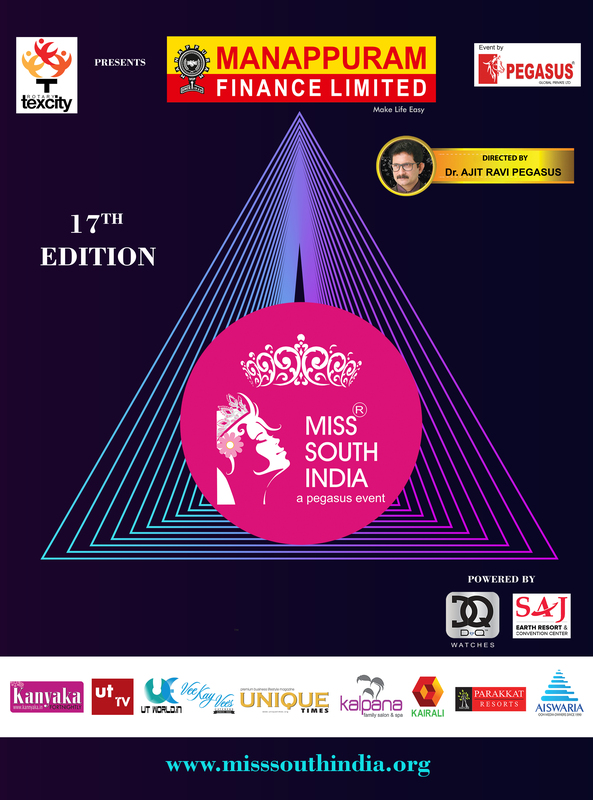 She might probably be most widely travelled woman from Kerala. On each travel, she retained on adding onto her collection whenever possible. She remembers sometimes, they had to hire vans to bring home bigger pieces. 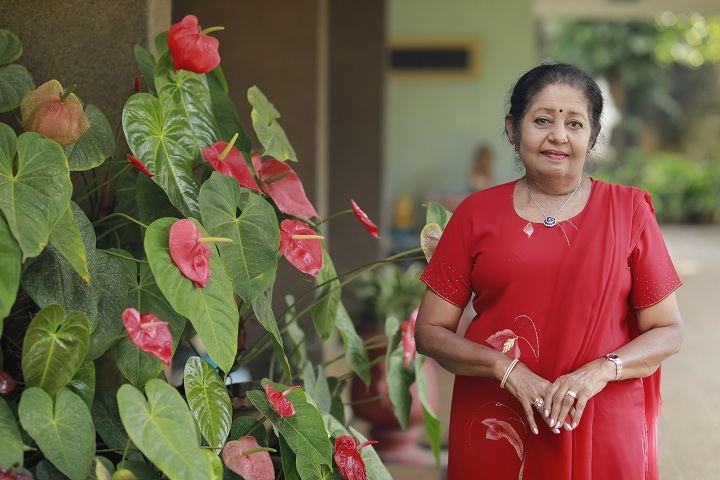 After her husband’s demise, she noticed all these artefacts spread across their houses in Kerala, and decided to showcase this cherished collection to the world, in the name of her loving husband. She is very satisfied with the architect, Lalichan from Ernakulam, who took all details from her meticulously and built the entire structure according to her gratifying will. Her husband’s great grandfather, Krishnan muthalali from Paravoor, near Kollam, has started collecting originally. He is credited to be the first Indian to set up a coir export unit, more than 100 years ago. Betty’s first and second mother-in-laws were German and Dutch respectively, were wealthy and brought with them several inestimable gifts with them including Swarovski and Lladro. 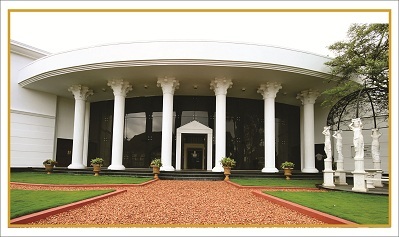 Revi Karuna Karan Museum is open on all days from 9am to 5pm except for Mondays and National Holidays. Being a zealous traveler, Betty visits museums around the world, gather more information about artefacts; most of the pieces in her museum grips a certificate of authentication. One of them is a masterpiece in porcelain by Capo De monte, is an ode to Paulina Bonaparte, the famed sister of Napolean. One single Mirsham stone unique to Turkey, another precious piece a president award winner work on Shakuntala in ivory, an Avatar Krishna statue in exquisite ivory with a Rama on the other side with equal detailing, the Swarovski feeding woodpecker piece of impeccable craftsmanship, the very interesting Lladro work in porcelain capturing the spirits of the Hawaiians – the museum is an endless abode of breathtaking artworks. Few pieces of obsidian-ancient volcanic rock resembling glass-formed from lava obtained from Mexico and Indonesia are rare attractions. “It was not so expensive but it is fantastic, the labour of the artisan, the passion, and in this case the never-say-die human spirit itself”, she says accentuating on the qualities that drew her to a piece crafted by a handicapped man. Apart from ‘negligible breakages’ she has never lost a single piece, as she attributes this gain to her outstanding skilled staff. Betty’s past time hobbies are traveling, collection of art and artefacts, gardening and reading. Her sprawling open home itself is environmentally artistic with nature’s blessings all around.